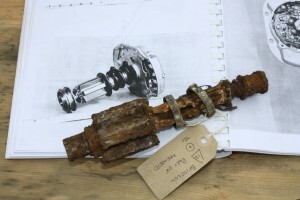 Last summer, participants on Operation Nightingale recovered the remains of Spitfire P9503 on Salisbury Plain. This was part of a project to provide two case studies of best recovery practice to English Heritage. 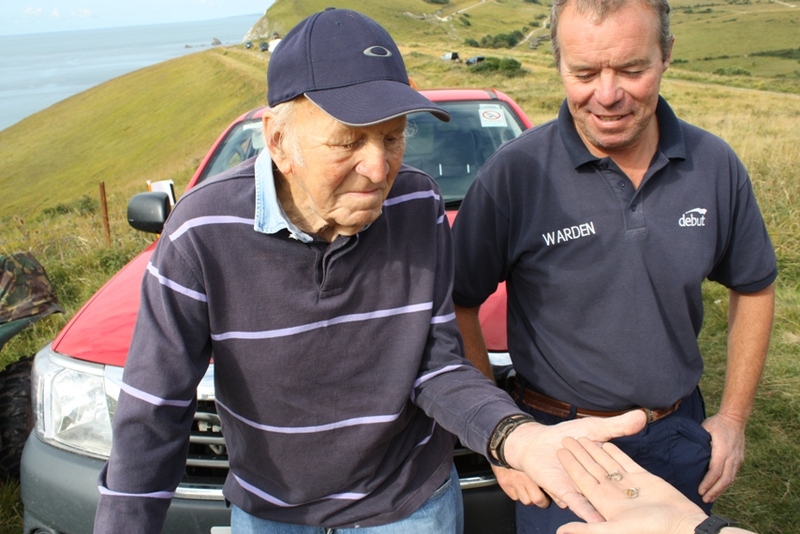 The second of these recoveries is taking place on the Lulworth Gunnery estate this summer – that of a Messerschmitt BF110 shot down on Adlertag (Eagle Day – 13th August) in the Battle of Britain in 1940. The recovery team on ‘Exercise Adlertag’ is composed of professional archaeologists from DIO’s Conservation team, Cranfield University, 5131 (BD) Squadron RAF, 42 Engineer Regiment, 1710 Royal Naval squadron (Aviation forensics), 1 Air Mobility Wing RAF, archaeological volunteers and military personnel recovering after operations, including many from The Rifles. Operation Nightingale was established by DIO and The Rifles. The programme helps personnel injured on operations, including Afghanistan, return to their regiment or prepare for civilian life. This helps the Ministry of Defence (MOD) fulfil statutory obligations and illustrates heritage best practice. The German plane, a twin-engine heavy fighter, is believed to have been from V (Z) Lehrgeschwader 1 on a mission to attack Portland, when it crashed on 13th August 1940. The crash was almost certainly fatal to the aviators as it is one of two possible candidates from this Unit. It is thought to be either that crewed by Lt Günter Beck, who is buried at Portland Royal Naval cemetery, whilst radio operator Uffz Karl Hoyer is listed as missing. In the other possible airframe, pilot Fw Hans Datz was made prisoner of war, whilst the radio operator Uffz. 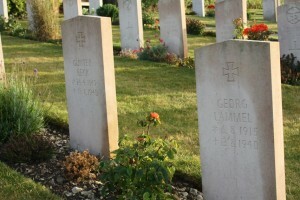 Georg Lämmel was killed and is also buried at Portland. All military aircraft crash sites in the UK, its territorial waters, or British aircraft in international waters, are controlled sites under the Protection of Military Remains Act 1986. It is an offence under this act to tamper with, damage, move or unearth any items at such sites, unless MOD has issued a licence authorizing such activity. Anyone wishing to recover a military aircraft, or excavate a military aircraft crash site in the UK must obtain a licence. The aim of the Operation Nightingale investigation was to determine the exact location and extent of the crash site and recover the remains of the air frame, which are suffering damage due to their location directly across on the South West Coastal Path. Following magnetometry, ground-penetrating radar and laser-scan surveys, the site investigation began with a walkover survey with metal detectors; each artefact being flagged and its location recorded. Areas with a high density of results have been selected for hand excavation by the team. The metal detecting survey has already illustrated a spread of debris from the air crash, even when signals that relate to modern tank ordnance were removed. Careful cutting of the turf quickly yielded fragments of the aircraft. To the north of the area, a trench was opened up to evaluate a large metal-detector reading. Soon five exhaust ports from one of the engines were found. Today the team had the pleasure of hearing something that you don’t normally get on archaeological sites; the accounts of an eye-witness to the events on how the material went into the ground! Tim Meaden recounted seeing the German raiders flying in tight formation from the east towards Portland, when they were intercepted off the Dorset coast by the RAF. This aircraft was soon shot down and plummeted to the ground. Although he didn’t see the impact, he soon travelled to the site to see if he could obtain a souvenir but was ‘asked to leave’. Lots of pieces of the aluminium ‘skin’ of the aircraft and pieces of engine are now being recovered from the central crater along with wires and electrical components and part of a magneto. 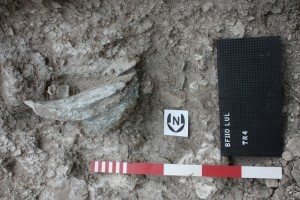 Just before lunch, the remnants of a propeller blade were found in the trench cut through the northern edge of what we are now certain to be the impact crater. A large unidentified cylindrical object has been found by the propeller along with a connector with three struts. The latter comes from near the undercarriage the former is anyone’s guess! One of the team brought along a wartime document written by the Americans to evaluate the BF110 – this is already proving invaluable as we have found a few parts with numbers stamped on them and it is a splendid guide for identification. One part states ‘made in Germany’ clearly indicating that several components were part of a pre-war export market. Given man y of the elements were made by Siemens, Bosch and Daimler-Benz this is perhaps not a surprise. 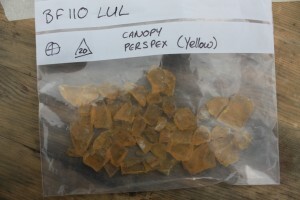 We have now recovered an increasing quantity of orange Perspex from the crash site. Aviation experts on site tell us that this comes from the BF110’s tinted canopy and provided some protection to the crew from the glare of the sun – this colour scheme is not something any of the digging team remembered from their Airfix days! Lots of 7.92 rounds from the German machine guns are being excavated along with several cases. The team will examine the latter for headstamps to establish the dates of the ammunition and also the place of manufacture. The Bf110 retained fired cases and the site has shown that this aircraft certainly fired back at the RAF fighters before it was brought down. Final digging. The team cleaned up the two impact craters caused by the mighty Daimler-Benz engines ready for a final photograph. Fragments of aluminium were being recovered right up to the point at which we needed to finish. 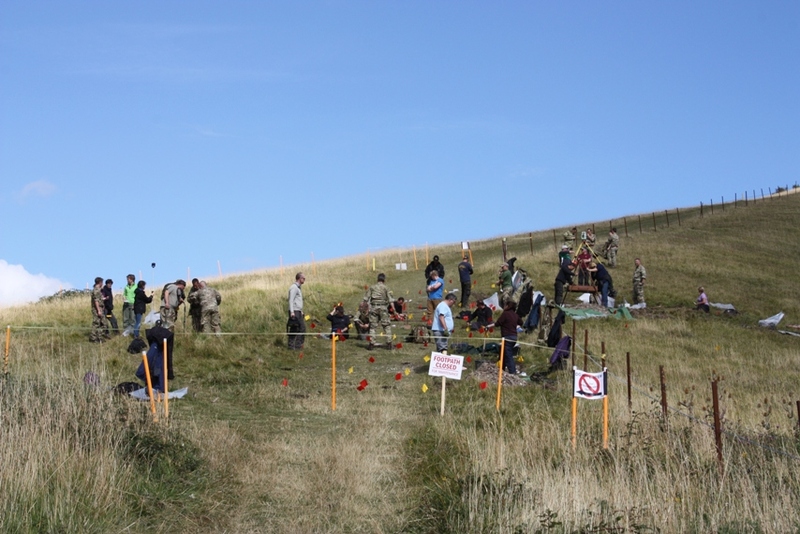 The overall site was then laser-scanned by the Royal Engineers to give us an accurate plan of the crash site and then the archaeology team backfilled all the soil and re-laid the turves over this protected (SSSI) grassland. Typically, just before we finished, a final (and quite large) area of crash clearance debris was located adding further fragments of the aircraft to the assemblage. Although no data plates or components leading to an identification of the works number of this aircraft were found, future work may still add extra information. The week proved to be very productive with large quantities of material recovered including fragments of propeller, Daimler Benz engines, ammunition (including spend cases illustrating that the rear gunner had, not surprisingly, fired back at RAF fighters), perspex canopy, magneto and other elements. The excavation demonstrated that the aircraft had crashed directly into the cliff at a near-vertical angle and had then been engulfed in flames. The remains will be brought to the lab at Wessex Archaeology to be processed by a volunteer team before further analysis can take place in attempt to gain as much extra information on the crash as possible. Following this, the results of the various surveys along with the artefacts recovered will all be drawn together to draw some final conclusions about the last moments of the aircraft. A very interesting article. I was walking from Lulworth Cove towards Kimmeridge when the area was being prepared for the excavation on 13 August 2014 and have been looking out for news about the investigation since. One small error I noticed in the piece is that the caption under the first photograph is incorrect. It was not a picture of Salisbury Plain but the dig site East of Arish Mell in the Lulworth Ranges. Many thanks for your kind comments. It's always nice to know someone has enjoyed the blog! Good spot on the caption, we'll change it now. Thanks! "Following this, the results of the various surveys along with the artefacts recovered will all be drawn together to draw some final conclusions about the last moments of the aircraft." Then what? What will happen to the wreckage at the end of the exercise? Hi Bob, thanks for reading. The wreckage was passed to the pilot's old school, Ratcliffe College in Northampton. Students there are part of an ambitious project to build a replica Spitfire so the artefacts are very helpful. 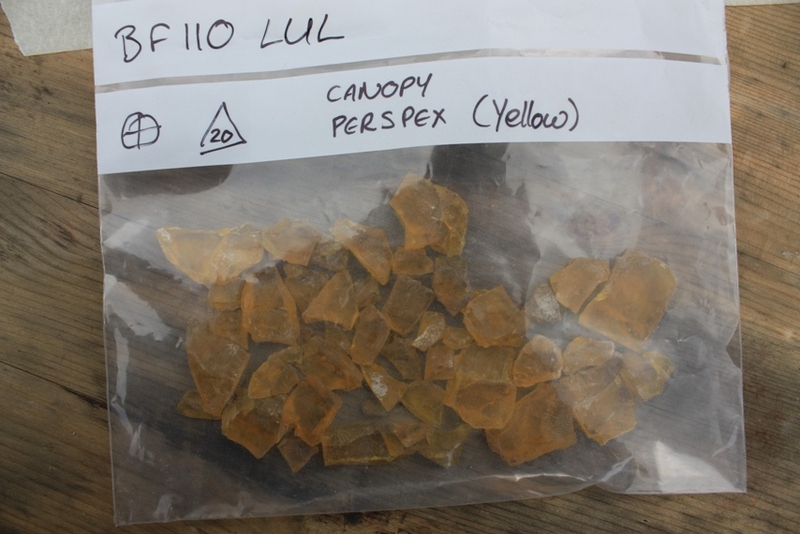 Yellow tinted material might belong to the search light transparency at the portside wing leading edge.